I came across this great Jeff Gage article about Texas Singer-Songwriter Robert Earl Keen and felt compelled to share it. I remember listening to REK on Red Dirt Radio Hour as a teenage boy growing up in Tulsa, Oklahoma and continue to enjoy his music to this day. As a fan of Red Dirt and Texas Country music, I cannot count the number of shows I've been to where the headliner, after covering one of his songs, would then tell their own Robert Earl Keen story about how they met him and what an honor it was to play on the same stages. I have always thought of him as the musical equivalent to a Comic's Comic and think this article does a great job of expounding on this idea. The first time I saw Robert Earl Keen in concert was at Cain's Ballroom in Tulsa, Oklahoma back in August 2005. It was the Monday before I was heading off to college and decided to go with my remaining friends as a last hurrah before we departed. Because it was a midweek show, the crowd was small and they had set tables up on the historic dance floor in front of the stage. While I was initially disappointed about the tables and the small turnout, I would not have had the fortunate experience of buying him a beer and chatting between sets without it being a more intimate show. I still enjoying sharing that story every chance I get. I soon became one of those Texas fraternity boys mentioned in the article. Whether we were cooking hamburgers at the house, out at somebody's ranch for the weekend, hanging out at an apartment complex pool, or enjoying a hot summer day on the Green Belt or Hamilton Pool, Corpus Christi Bay and Gringo Honeymoon always found their way onto our playlists. We even made the pilgrimage to Texas Country Mecca to see Robert Earl Keen play at Gruene Hall. Most recently, my wife and I got to see him in concert with Lyle Lovett in Albuquerque, New Mexico in February 2018. We were not sure what to expect seeing him at a performing arts center rather than a beer joint/dance hall. The banter between the two of them and the stories of their musical careers between songs was every bit as entertaining as the music they played. They told stories about touring with artists they admired like Guy Clark and the late Townes Van Zandt. It was very similar to the way Randy Rogers, Cory Marrow and Pat Green talked about Robert Earl Keen when I used to see them in concert. My top 5 Robert Earl Keen songs (in no particular order). Please use the comments section to share REK stories, as well as, your favorite songs that didn't make my top 5. Having lived in New Orleans for several years in my mid-20s, I indulged in many of the unique experiences that the city has to offer. When I knew that I would be relocating for work, I made a bucket list of all the restaurants that I wanted to visit before my impending move. One meal that I was unable to cross off my list was Friday Lunch at Galatoire’s. Upon learning that my wife would be traveling to New Orleans for a conference, I decided to tag along and try to get a seat at the table. While most popular restaurants in New Orleans require a reservation, Friday lunch at Galatoire’s is the exception. Tables in the first-floor dining room are reserved on a first-come, first-served basis. A staff member will appear outside the restaurant door around 8am and will begin taking names for the 11:30 seating. With only 41 tables and 132 seats, the list fills up between 8:30-10am on most Fridays (notable exceptions: the Fridays before Mardi Gras and Halloween when tables are auctioned off for charity.) There are also professional line sitters that will show up early and put your name on a list for a fee. For those who are unable to get a seat during the 11:30 seating, there is a second seating following this (whenever tables open up) and reservations may be made for the upstairs dining room. However, my local friends stressed the importance of eating downstairs with the first seating to really get the full experience. Unfortunately, I underestimated the impact of the line sitters and did not get to the restaurant until 8:45am. By the time I reached the front of the line, the list for the first seating downstairs was full, and the host was taking names for the upstairs dining room. So after the crowd dispersed, I went into the restaurant to see if I could grease some palms to get my name on the list. The host declined my gratuity but offered to put my name on the list for the second seating. He instructed me to return around 1:30 and hopefully we’d get seated around 2pm. Seeing that this was my next best option, I put my name on the list and left the restaurant. I cursed myself for staying out too late the night before and texted my wife the disappointing news. She walked over from the conference early anyway to kill time while we waited for our table. After we had made it only a few blocks, I received a text from the restaurant that our table was ready just a few minutes after noon. We raced back to restaurant and the host informed us a table no-showed and that we were the next duo on the list. As the second to last table seated, and having defied the odds of getting a seat without paying a line sitter, we walked into a packed dining room and eagerly awaited our turn at the Friday Lunch experience. The best words to describe the temperment of the room are jovial and energized. With patrons dressed in their Sunday best, multiple tables with large birthday balloons floating above, and a large table of rowdy groomsmen helping send off an expectant groom, everyone in the dining room appeared to be celebrating something. Throughout the meal, servers would clang glasses to get the restaurant’s attention so that everyone could participate in celebratory birthday toasts and singing "Happy Birthday." The entire dining room participated with the same enthusiasm for each toast as if it were for one of their tablemates. People were up and about tablehopping, drink in tow, saying hello and catching up with friends who serendipitously happened to be at Galatoire’s as well as visiting with strangers. It was impressive to watch the staff navigate through the chaos. They had an unbelievable knack of appearing when needed then disappearing to let you enjoy your meal. Plates were cleared as soon as the last bites were finished, and new drink orders were taken as soon as glass bottoms were raised for the last sip. With tables placed closely together, you cannot help but interact with the neighboring tables. We quickly learned that the table next to us consisted of a middle-aged couple treating their college age daughter and her boyfriend to lunch to commemorate the boyfriend’s first trip to the Crescent City. They were regulars at Galatoire’s and wanted their daughter’s boyfriend to have a quintessential New Orleans experience. When they asked what we were celebrating, I told them about my bucket list and not getting to cross it off during my time living here. They welcomed me back to the city and informed us that we were in for a treat. My wife mentioned that she was here for a conference and that, if we had to celebrate something, she had celebrated a birthday last week. After discovering we were from out of town, they proceeded to inquire about all the places we had eaten and the sights we'd taken in during the week. We also traded suggestions of books to read, places to eat around town and made friendly conversation. The only breaks in the conversation were the birthday toasts and eating as the food arrived. However, the conversation would pick back up between courses. At one point during the meal, the wife snuck off to tell our waitress about my wife's recent birthday so that she could also get her own birthday toast. They were our de facto tour guides for the duration of the meal and definitely enhanced our dining experience. We ended the meal by exchanging emails and well wishes. While my wife and I enjoy a good meal, neither of us are very familiar with traditional French Creole cuisine. However, we are generally adventurous eaters and enjoy sharing so we get to try everything on the table. Luckily, the table next to us told us close our menus and let our waitress guide us through the meal. Our server, Martine, quickly appeared and took our first drink order. When she returned, she recommended we start off with the soufflé potatoes and the Galatoire Goute (pronounced goo-tay), which consisted of shrimp remoulade, Crabmeat Maison and a crawfish salad. She instructed us to either dip the potatoes in hollandaise sauce or to stuff the potatoes with the Goute. Next, we ordered our second round of cocktails and proceeded with the duck and andouille (pronounced an-doo-ee) gumbo and the iceberg wedge salad with apple smoked bacon that was sweet enough to have been candied. After letting our food digest and enjoying our cocktails, our server returned to take our order for the main entrees. After telling Martine that we wanted both a fish and a meat entrée, she suggested that we order the redfish with the crabmeat Yvonne garnish and the petite filet cooked medium rare with béarnaise garnish. For sides, she recommended the cream spinach and asparagus hollandaise. We ordered our third cocktail and eagerly awaited out meal. When our entrees arrived, Martine had noticed that we had been trading plates mid-course and had the entrees split in half before arriving at the table. As a self-proclaimed bread pudding aficionado, I was looking forward to trying the house bread pudding with their banana praline sauce. My wife was also eyeing the black bottom pecan pie with an oreo crust and whiskey caramel sauce. After consulting Martine, we ordered both. Our new friends at the table next to us also recommended that we try the café brûlot (pronounced bru-low) which he described as a brandy spiced coffee drink that is set on fire. With an endorsement like that, we were unable to say no. Both desserts were delicious, but we both agreed the pecan pie was the superior dish. While neither my wife nor I routinely order cocktails with lunch, we decided that Friday Lunch at Galatoire's would be an exception. I started off with the Kentucky Reserve which consisted of Woodford bourbon, tuaca liqueur, Angostura bitters and a brandied cherry served up in classic coupe glass. The drink was well balanced with a boozy base and a sweet finish. My wife’s first round was the Old Fashion, which was made in the classic style, with bourbon, Peychaud’s bitters, house made simple syrup, orange and a maraschino cherry in a rocks glass. My wife’s next round was the Galatoire’s Milk Punch, which consisted of bourbon, milk, vanilla, simple syrup, and nutmeg. It honestly tasted like a boozy milkshake. I went for the Galatoire’s Specialty Cocktail which was essentially a Sazerac with bourbon instead of rye whiskey. For round three, I ordered a Sazerac which was made up of rye whiskey, Herbsaint, Peychaud’s bitters, simple syrup and a lemon twist. My wife, who was warming up her palate for dessert, went with the house’s take on the Classic Daiquiri. They used Louisiana’s own Rougaroux Sugarshine Rum, lime juice, simple syrup, lime, shaken and served it neat. The 101-proof rum with the lime juice gave the drink a kick and acidic bite that made the drink much more palatable than the sweeter versions of the drink I have previously encountered. After eating an incredible meal, imbibing in delicious cocktails and saying farewell to our new friends that we made over the past four hours, we settled up with our server (after taking a selfie together) and made our way out of the restaurant. While I had high expectations for our Friday Lunch at Galatoire’s, the experience exceeded them all. People often say that outside of New Orleans, Mardi Gras is just another Tuesday, I think the same sentiment can be applied to Friday lunches not at Galatoire's. 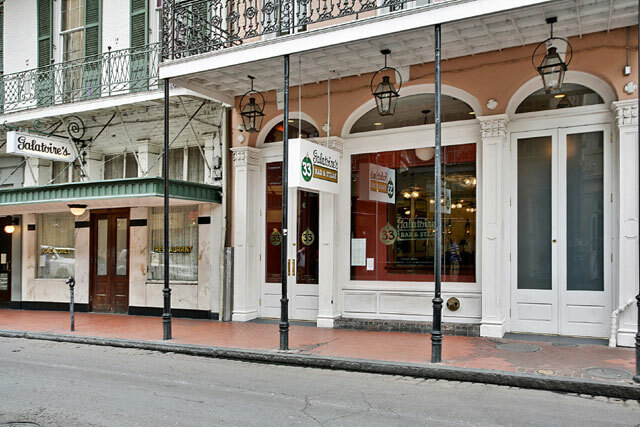 Lagniappe: While waiting in line, I chatted up some of the hired line sitters and got a phone number that I can use the next time I want to eat at Galatoire’s. Contact me and I will share the contact information. While I was reading the current issue of New England Journal of Medicine this week, I came across an interesting perspective article. Usually I skip these articles and focus on clinical studies, images in medicine and review articles that usually have higher yield information that I can apply to help care for my patients. However, Dr. Jerry Avorn's article, The Psychology of Clinical Decision Making- Implications for Medication Use, caught my attention. Essentially, he discusses how a lot of clinical decision making in medical education is based on the assumption that both clinicians and patients "behave rationally" meaning that with appropriate information they will make decisions that maximize health benefits and minimize risk of harm. However, my clinical experience has shown me, often on a daily basis, that both patients and clinicians act irrationally. A relevant example would be the treatment of influenza. A lot of patients are hesitant to get the flu shot but will call my office for oseltamivir (tamilfu) after the first cough, sneeze, or runny nose despite what most clinicians consider to be overwhelming evidence that the vaccine is significantly more effective that tamiflu. A 2014 British Medical Journal sytematic review looked at the 83 articles which reviewed the potential benefits of Tamiflu. From this review, Tamiflu has good evidence supporting reduced time from onset of illness to first alleviation of symptoms from 7 days to 6.3 days (16.8 hours). When used as a post exposure prophylaxis agent in patients exposed to the flu, it has been shown to reduce risk of symptomatic flu by 55% . There is not evidence to show that it reduces rates of hospitalizations, death, diagnosis of post flu pneumonia (lung infection) , bronchitis, otitis media (ear infection) nor sinusitis (sinus infection) any better than placebo. Now lets compare tamiflu to influenza vaccine. According to the CDC, the influenza immunzation (flu shot), has been shown in studies to reduce flu-related hospitalizations for the general population. This impact is even greater in high risk patient groups such as diabetics (79%) and patients with chronic lung diseases (52%). A 2017 study, published in Pediatrics, shows that from 2010-2014, children who received flu shots had a decreased risk of dying from the flu by 51% in healthy children and 65% in children with underlying medical conditions. There is also an incredibly large amount of information documenting safety of the influenza vaccine in both children and adults. From reading the above information, it seems like the rational choice would be to get an annual flu shot. However, a large number of patients are still not immunized. According to the National Immunization Survey-Flu (NIS-Flu) and Behavioral Risk Factor Surveillance System (BRFSS), vaccination rates for adults have been approximately 40% for adults and 55% for children from 2009-2016. This means over 50% of adults and almost 50% of children fail to get immunized despite the above information being known and readily accessible. While there is a large amount of research in fields such as behavioral finance, I have not seen anything like this being studied in medicine. I think this issue is only going to become more important as quality metrics (diabetes bundles, BP goals, Heart Failure bundles, adherence to guidelines) continue to become more important for physician evaluation and institutional accreditations. While there is so much we have yet to learn in the field of medicine, I think there is some low hanging fruit in discovering why we fail to provide care to the best our knowledge. I'd even be willing to wager that some of the tools used in behavioral finance could be used to nudge patients and clinicians into making better healthcare decisions. The recent declines in the US publicly equity markets in response to good US economic data support the argument that quantitative easing and near zero interest rate policy has created a bubble in the US stock prices. There seems to be a consensus that prices will continue to decline as interest rates normalize. While I concede that cheap money has been a major driver in the rise in US asset prices, I think there must be other factors at play. Japanese markets have not had the same run up in asset prices, despite similarly low interest rates and quantitative easing. Tyler Cowen offers a contrarian hypothesis for high US asset prices in his recent Bloomberg article. He suggests that at least a portion of the rise in US asset prices is due to a lack of alternative financial institutions to store wealth. According to the Credit Suisse Research Institute's Global Wealth Report 2017, global wealth is up 27% from 2007-2017. This approximately $60 trillion in new wealth has to be stored somewhere and the US public equity markets have received a large share of invested capital. I have included an excerpt from Tyler's Article below. Below is a rather thoughtful comment in response to my previous post, License To Pump. Tip of the cap to SP for taking the time to share his thoughts. I think the burden regarding a need for license should be based on the degree of which negligence can lead to harm. I do not think a gas station attendee, hairstylist or manicurist can cause significant harm without committing an act that would be criminal under existing state and federal laws. I think high risk occupations with specialized privileges should be licensed. However, I think the purpose of licensing should be to validate credentials, demonstrate continuing education in their area of expertise, and to monitor for egregious behaviors (technical, or criminal) that would limit the ability to competently perform key job functions of the licensed profession. My frustration with medical licensing in general is the amount of redundancy required at each step. In my personal example, this is the third full physician license that I have applied for in my short career. Furthermore, I currently have an active license to practice medicine in another state. In order to get my current license, I had to provide proof that I graduated from medical school, successfully completed a one-year internship, completed a residency training program in good standing, passed STEP I, II and III of US Medical License Examinations. I had to provide proof that I had a residency permit and medical license in the state where I completed my residency and obtained my previous medical license. I also had to prove that I did not have any complaints filed on either of those licenses. In addition to proving my credentials, I had to provide information regarding facilities where I worked, including a part time moonlighting gig at an urgent care center, to verify that I had not been professionally disciplined by my employer. I also had to submit fingerprints for an FBI background check. I also had to verify my DEA license and State Board of Pharmacy license history. All of this information must be sent directly from the third party (for a fee) to the Medical Board where I applied for my license. Fortunately, my credentials were verified and I passed the criminal background check and obtained a medical license to practice in my current state. Once I had a license, I was able to apply for jobs. To get credentialed to practice medicine (which I was granted a license by the state medical board where my employer is located) at my current employer, I had to verify all of my credentials again. Rather than contacting the state medical board to verify my credentials, I had to contact all the agencies that verified my credentials for my medical license again and have them send my information to my current employer. Since moving to my current state, I have been continuously employed by one employer, obtained a new DEA and new state controlled substance license, and became board certified by the American Board of Internal Medicine. In order to sit for board exam, you must verify that you graduated from medical school, completed internship and residency in your given specialty, passed USMLE Steps I, II and III. Again these credentials must be verified directly from the agency issuing certifications. One would think that in order to get a Texas Medical license, I would have to verify my current medical license is in good standing, prove that I have not been professionally disciplined by my current employer, submit to a new FBI background check with fingerprints, verify my board certification, and verify my DEA and state controlled substance license history. Unfortunately, that is not how it works. I had to repeat every single step that was required to obtain my current license. This including verifying that I had completed medical school, internship, residency, passed USMLE Step I,II, III (all of the things my current state medical board and the American Board of Internal Medicine had both already independently verified). I also had to contact the state medical board where I completed my residency and granted me my previous, and no longer active, medical license again. I also had to contact the institution where I did my residency, and the urgent care center that I worked on the weekends during residency to make extra money. All of these agencies and institution were required to directly send requested information to the Texas Medical Board. Texas also requires a jurisprudence exam to make sure physicians understands rules that are unique to practicing medicine in the state of Texas. The purpose of this exam is to make sure you know how the Texas Medical Board works and has nothing to with the applicant's ability as a clinician. However, I think it is a fair requirement for physicians who want to practice medicine in Texas. I would argue that re-verifying information that has already been verified by multiple independent agencies, does very little, if anything, to improve patient safety if I am granted a Texas Medical License. Came across this interesting blog post on Financial Samurai. The author discusses investment risk and portfolio allocation. While I'm not a member of the FIRE (Financial Independence and Retire Early) movement, the article was still worth a read. I found the charts comparing the average annual returns for various hypothetical portfolios particularly interesting. I was surprised to see that the average annual return for an 80% stock 20% bond portfolio underperformed an all stock portfolio by less than 1% per year over the past 100 years. Financial Samurai is a personal finance blog created by Sam Dogen. Paul Kaseburg, Chief Investment Officer at MG Properties Group, shares how he thinks about allocation within the real estate asset class on a recent RealCrowd podcast. He spends a majority of the episode discussing strategies to increase diversification within a real estate investment portfolio. I found his discussion of vintage diversification as a strategy to mitigate market timing risk particularly interesting. Individual investors can leverage crowdfunding platforms to implement many of these strategies in their own real estate investments. RealCrowd is a real estate crowdfunding platform for accredited investors. However, they do have a lot of free learning resources available to the public. George Will shows the tentacles of crony capitalism extending into our laundry rooms in one of his recent Washington Post articles. This is just another example where our government has chosen to prop up a special interest at the expense of the American consumer. I have no doubt we will be seeing many articles celebrating the number of US manufacturing jobs that will be saved by this tariff. However, the article I'd most like to see is one that shows how much we are spending to save each job. While it will be easy to compare the average price of a washing machine before and after the tariff takes effect, it will be impossible to calculate the potential impact of those additional dollars if they had been spent on higher and better uses. I'd like to think we would all be better off if we spent the same amount of energy and resources creating new jobs and industries as we did protecting the old ones. If Whirlpool wants US consumers to choose their products, they should make better or cheaper washing machines. I have included George's description of tariff and the impact of the whirlpool tariff below. This is a tax, paid by American consumers, on imports that exceed a certain quantity that, in the government’s opinion (formed with the assistance of domestic manufacturers), is excessive...The tariff/tax, which is designed to limit the choices of, and increase the prices paid by, American consumers would be 50 percent on all imported machines, after the first 1.2 million. U.S. customers caused the importation of about 3 million Samsung and LG washers in 2016. Lagniappe: A previous Blog post about crony capitalism in the airline manufacturing sector. Timothy Taylor's recent blog post highlights the magnitude of economic growth in China over the past 40 years. I have included the most impressive excerpt below. The share of China’s population below the poverty line, modestly defined as having a consumption level of $3.10 per capita per day, has fallen from 99 percent of the population to 11 percent. Per capita GDP has risen from $200 per person to $8,200 per person. Life expectancy has risen from 66 years to 76 years. Infant mortality per 1,000 live births has fallen from 48 to 9. The literacy rate for those 15 and older has risen from 66 percent to 96 percent. The share of China’s total population over age 25 who have completed a secondary-level (high school) education has risen from 6 percent to 22 percent. Such a list could be extended, of course. But the bottom line is that more than a billion people in China have risen out of a combination of grinding poverty, poor health and low levels of education to what the World Bank classifies as “upper middle income.” A Chinese person who was a young adult back in 1980 has observed the entire process in his or her own lifetime — and hasn’t yet reached retirement age. George Mason University economist and author of Marginal Revolution, Tyler Cowen discusses the limitations of using common macroeconomic tools like GDP and GNP to evaluate the impact of foreign investment in one of his more recent blog posts. If the main purpose of trade is to increase the number of goods and services available to an individual, consumption based measurements should be a part of the analysis. I am not sure how trade that enables a consumer to purchase more goods for the same level of spending can be bad for an economy. Lagniappe: Tyler that discusses how the GOP tax plan and Trump's objective to decrease US trade deficit are seemingly at odds in a recent Bloomberg article.